French filmmaker Leos Carax is an acquired taste. Critically acclaimed but marginalised by any kind of real international success his trajectory through the 1980s and 1990s was marked by a poetic desire to depict love in all its torture, lust and ugliness. Like Rainer Werner Fassbinder without the work ethic, his films fill that slender cinematic gap between compulsion and delusion, madness and sentimentality towards the grand themes. Anyone who has seen his tales of debased amour fou: Boy Meets Girl, The Lovers on the Bridge and particularly Pola X can stand testimony to this. 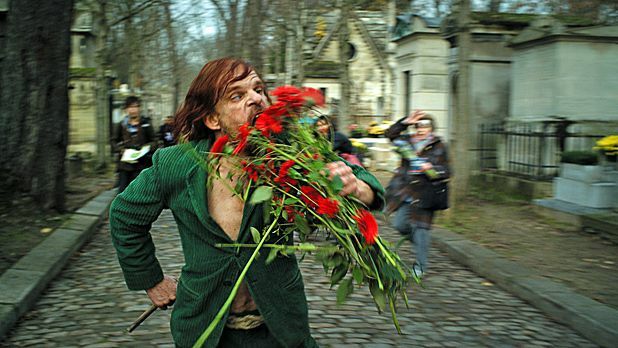 Holy Motors, his first major work in thirteen years is the work of a filmmaker slightly mellowed by the passing years but not seduced by the seclusion and meditative space that time has given him. In short it's every bit as bonkers as his previous forays. Essentially a blackly comic riff on theories of parallel universes, Holy Motors is deranged, compelling and beholden of its own curious outsiderness. Any film that features the great actor, filmmaker, screenwriter, musician and singer Michel Piccoli and Kylie Minogue also deserves your attention. First film in over a decade from Carax, starring Lavant as a man who travels between multiple parallel lives.